Classic tale of teen rebellion and repression features a delightful combination of dance choreography and realistic and touching performances. When teenager Ren (Kevin Bacon) and his family move from big-city Chicago to a small town in the West, he's in for a real case of culture shock. Though he tries hard to fit in, the streetwise Ren can't quite believe he's living in a place where rock music and dancing are illegal. There is one small pleasure, however: Ariel (Lori Singer), a troubled but lovely blonde with a jealous boyfriend. and a Bible-thumping minister, who is responsible for keeping the town dance-free. Ren and his classmates want to do away with this ordinance, especially since the senior prom is around the corner, but only Ren has the courage to initiate a battle to abolish the outmoded ban and revitalize the spirit of the repressed townspeople. Fast-paced drama is filled with such now-famous hit songs as the title track and Let's Hear It for the Boy. 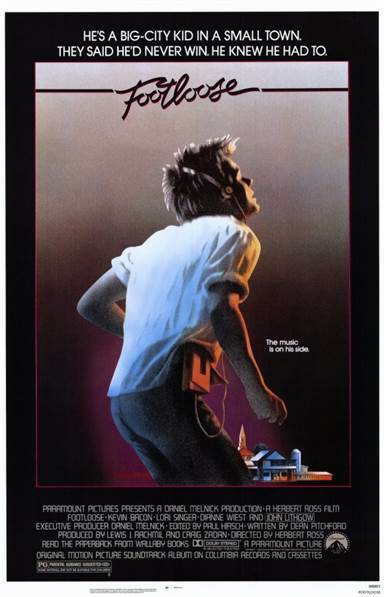 Download Footloose in Digital HD from the iTunes store. Footloose images are © Paramount Pictures. All Rights Reserved.